Backyard Autumn Night Sky over New Jersey: Star and Jet Trails Looking South. Night and early morning star and jet trails. Also, two very faint meteor trails. Composite of 193 images taken with a Nikon D810A camera and 24 mm f/3.5 PC-E camera (ISO 200, 24 mm, f/5.6, 120 sec). Raw images processed with Lightroom (to convert the RAW image to TIF) and Photoshop CC. 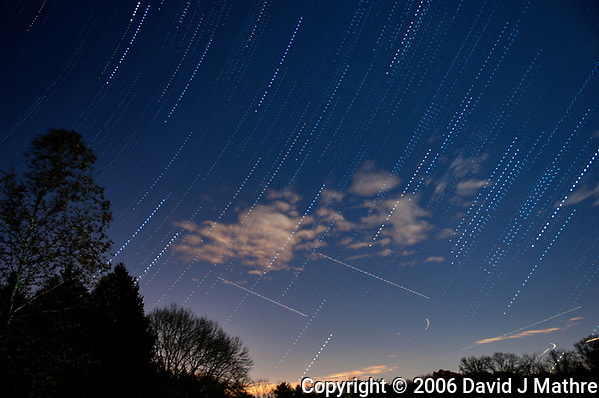 Backyard Autumn Night Sky Over New Jersey: Star and Jet Trails. Learning from mistakes. 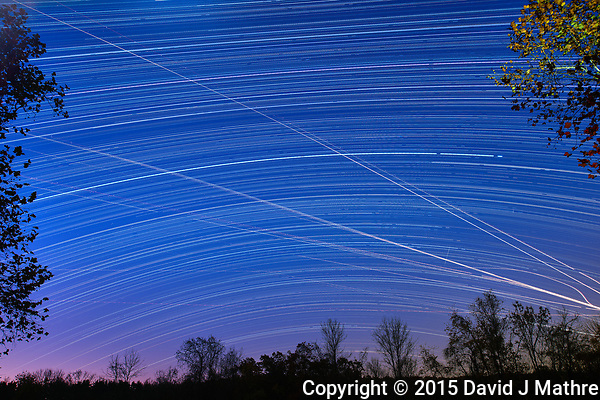 It took a while to figure out how to make star trail images with a digital camera. My first attempts to do long exposures ran into problems with digital sensor noise, the length of time the shutter could remain open, and camera battery life — especially on cold nights. The camera had an option for “long exposure noise reduction”, however this required taking a second exposure with the shutter closed and then subtracting the sensor closed image from the sensor open image. The result is missing every other exposure needed for a smooth composite star trail image. Other than the Big Dipper, Orion was probably the second constellation I learned to recognize.